My husband “grew up” eating at Vendetti’s so I’ll let him take over this review. Growing up in Shelby Township, I’ve been going to Vendetti’s Spanky House for years. Did I say years? I mean decades. I can’t say this is going to be fair review because I’ve never eaten more than 1 of Vendetti’s menu items. 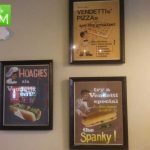 I go to Vendetti’s for the Spanky! 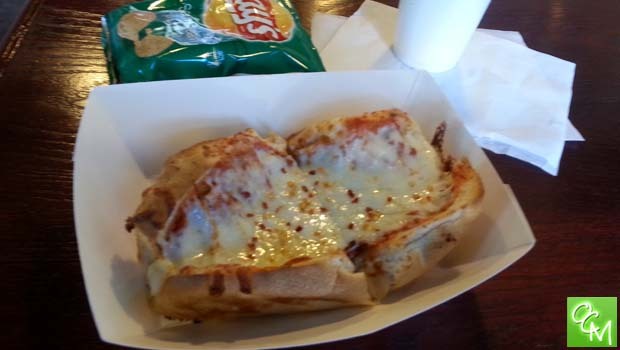 The Spanky is a homemade pepperoni bun stuffed with homemade meat sauce and delicious mozzarella cheese. 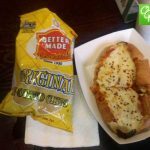 The Spanky is the type of menu item you would see on Food Network Television and the Spanky is worth the drive to Oxford from Rochester or anywhere else in Oakland County. Vendetti’s Spanky House moved to Oxford in 2011. I talked to Dino, Vendetti’s owner, about the move. 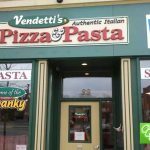 Dino explained that the lease for Vendetti’s was up at his old location and that the rent was cheaper in Oxford. It was a tough decision for Dino to make as Vendetti’s had many loyal customers in Shelby. He’s excited about his new location in Oxford and he’s likely hoping Spanky die-hards (like me) will make the trek to the new restaurant to check it out. 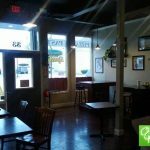 The new location is a little smaller than the old one but it’s ideal for a quick lunch or carry-out. 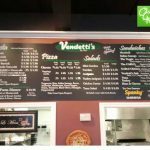 Vendetti’s Spanky House serves pizza, salads, pasta, sandwiches and desserts in addition to the Spanky. 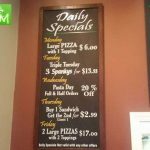 Vendetti’s has daily specials and an extremely affordable menu I’m sure residents of Oxford will appreciate. Like I said, I’ve never broken my Spanky cycle so I can’t tell you much from my experience with the rest of the food at Vendetti’s. I can attest to the old Vendetti’s customers that the Spanky tastes as great as ever. If you’re making a trek to Vendetti’s, you can load up on Spankys by buying them frozen. I’ve done this in the past. Just give Vendetti’s a heads-up and they can make you frozen Spankys (with baking instructions) so you can enjoy them anytime from home. If you’re near Shelby Township, you can buy frozen Spankys at the Marathon gas station on the SE corner of 25 Mile and Shelby Rd or you can buy them hot and fresh at Vineyards 45747 Mound Road, Shelby Township, Michigan 48317. For more info on Vendetti’s Spanky House Oxford, visit their facebook page.